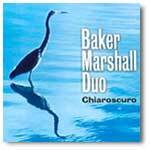 Baker and Marshall are both experienced composers and performers of classical and jazz music. They bring to their spontaneous compositions a wide range of musical experience. At a time when so much of our culture is prepackaged and electronically manipulated, spontaneous composition offers music that relies on the coming together of two creativities to generate something "in the moment". Since all the compositions are completely improvised with no preset form or parameters, the music is alive and unpredictable. This unpredictability makes the music exciting for both the audience and the performers. Although there are no preset parameters, each composition has its own logic and artistic validity, whether through idea development, forms that merge spontaneously, or colour coherence. The music of the Baker/Marshall duo is best described as avant-garde jazz in which they blend many musical idioms including traditional and contemporary classical and jazz, folk, pop and world music along with environmental sounds. This eclecticism serves to create dynamic spontaneous compositions which join together melody, harmony, dissonance, cacophony and rhythm. This style of improvised music allows the freedom to express an emotional intensity that is vital and electrifying. Audience responses from musicians and non-musicians alike, have been extremely enthusiastic. They report that, as listeners, they feel very much a part of the performance, given that both they and the performers bare an anticipation of how the music will unfold. Our audiences report hat they find our music appealing and accessible with its wide variety of styles and focus on lyricism amidst avant garde techniques. Click here for a review by Anthony Holt. If you would like more information on this CD or to download other MP3 tracks please visit the Canadian Music Centre Website.